Queenstown is New Zealand’s adrenaline capital, but bungee jumping and skydiving aren’t for everyone. This 360° Virtual Reality experience at the Thrillzone theme park will get your adrenaline pumping with zero risk, as you battle aliens, explore dark dungeons, and get transported to a fantasy world via a state-of-the-art simulator. Make your own way to the Thrillzone theme park in central Queenstown and use your pre-paid tickets to gain instant access. 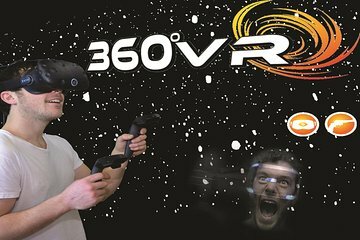 Your tickets for the 360° Virtual Reality simulator experience are valid at any time between 10am and 9pm, and there’s no need to book ahead, so simply turn up and head inside for the next showing. Once inside, settle into your seat and prepare for a thrilling 10-minute cinematic experience, using surround sound, multi-sensory effects, and active motion seats to bring the fantasy world on-screen to life. Battle with aliens, cast spells in dark dungeons, and be blown away by the state-of-the-art simulator.